CHAMBA: Gopal Singh, Raja of Chamba (ruled 1870-1873). bl.uk > Online Gallery Home	> Online exhibitions	> Asia, Pacific and Africa Collections	> CHAMBA: Gopal Singh, Raja of Chamba (ruled 1870-1873). 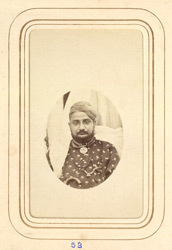 Head-and-shoulders carte-de-visite portrait of Gopal Singh, Raja of Chamba, 1870-73 from the 'Album of cartes de visite portraits of Indian rulers and notables' taken by Bourne and Shepherd in the early 1870s. Chamba in Himachal Pradesh was the capital of the princely state of the same name. Chamba was built in the 10th century by Sahil Varma and named after his favourite daughter, Champavati. Gopal Singh came to power in 1870 but abdicated in 1873; he died in March 1895 at Manjir. He is credited with building a beautiful palace at Jandarighat as his summer residence.